From an excellent range of pedals, this is just the ticket for a toneful clean boost. The clean boost is excellent. Considerable size and weight on your pedalboard. The extra hassle of the (albeit included) 16V PSU. Blackstar is a relatively new British company, launching in 2007, that boasts an R&D and engineering team that cut its teeth with perhaps the biggest amp name of all time: Marshall. Breaking out on their own in this new venture, Blackstar has its own range of range of amps as well as various valve-driven pedals. They're all devoted to that most satisfying of pursuits: distortion and drive. The pedals share various features. Each is loaded with a single Russian-made ECC83 dual-triode preamp valve, backlit to glow red. More interestingly, that valve runs off a full 300-volt circuit, (hence HT in the name: HT for 'high-tension' meaning high voltage). This is thought by many to offer better tone, gain and overload characteristics than low-voltage valve pedals. After that, all except the HT-Boost offer a speaker-emulated out alongside the regular output for a direct-to-desk recording option, and finally, three of the quintet are loaded with what's called an ISF (Infinite Shape Feature) control. Unlike more familiar contour circuits, this enables you to move the entire EQ section voicing between what you'd expect of two classic amplifier tone circuits: Fender at one end and Marshall at the other. "The ISF came about because we were looking for a way to voice testbed amplifiers for artists," explains Blackstar's technical director, Bruce Keir. "We needed a way to continuously vary the tone beyond what was available from existing amplifiers. This would enable the player to create their signature sound before we 'locked it off' in their preferred setting. The method we came up with gave the ability to not only get the standard reference tones, but also the 'in-between' never-before-attainable voicings as well. It worked so effectively and so simply that we decided to make it a feature available for all guitarists to use." Indeed, the ISF control broadly apes the tonal response of classic 6L6- or EL34-powered amps, plus many points in between. You'll find the other pedals reviewed on MusicRadar, but here we have the HT-Boost BT-1. If you have a classic amp that you love the sound of, chances are you don't want a modern-sounding pedal with tons of overdrive and distortion, but you still want a little - or big - push. So here the boost control works with the bass and treble controls to cut or boost your signal in those frequency bands: a simple way of tuning the pedal to your amp's voice. Another interesting feature is that instead of the emulated out, you get two outputs, one for use with solid-state or hybrid amps and one for use with all-valve rigs. The 'high' output is hotter, presumably because you don't want to overload the front end of your transistor amp too much - not a good sound. Boost pedals traditionally work best with clean-ish, just-on-the-edge valve amps: it's a toneful, dynamic place to be as a guitarist. With the tone controls set to the middle and the boost control to around three it effortlessly gives a huge volume hike to a clean tone without colouring your sound. 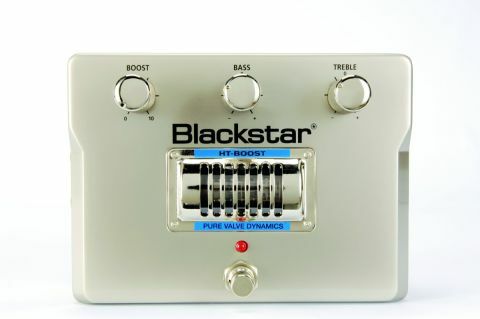 Of all Blackstar's pedals this HT-Boost BT-1 one retains your amp sound most faithfully. Country, funk, blues and indie fans, your search for a natural clean boost may well be over. If your amp is already driving at the preamp stage, the HT-Boost encourages more compression and sustain. Then the bass and treble controls can be used to temper or indeed exacerbate the drive characteristics of the low and high end. Think of it as a higher fidelity MXR Micro Amp with tons more flexibility and you're not too far wide of the mark.